Developed for a general biology course for non-majors, this case focuses on prairie habitat ecology and restoration. Jim, a young ecologist, has created a reconstructed prairie in his backyard. His neighbors don't like it and they have complained to the local building inspector. The city weed ordinance is very clear about vegetation management, and Jim has been told that he must mow his plants and keep a tidy lawn like everyone else in the neighborhood. But he feels strongly that his efforts to create a more sustainable form of landscape in the Midwest town in which he lives are being misunderstood. Eventually, Jim will have to defend his case in court. 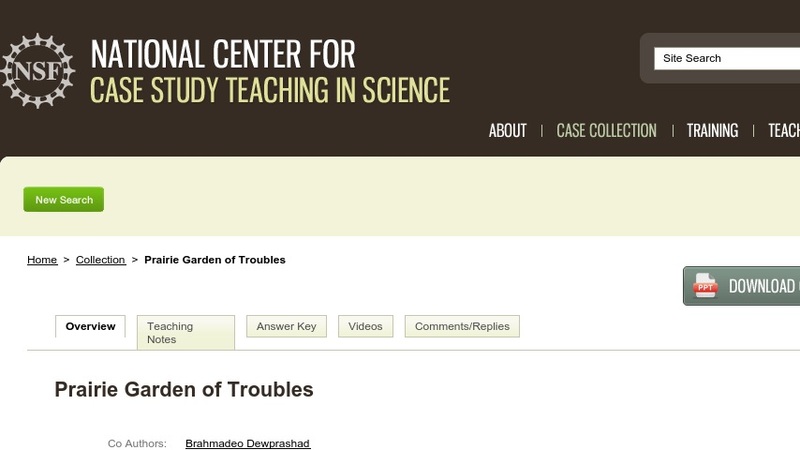 The case is presented in class as a series of PowerPoint slides (~10MB) with multiple-choice questions that students answer using personal response systems (“clickers”). It could be adapted for use without these technologies.